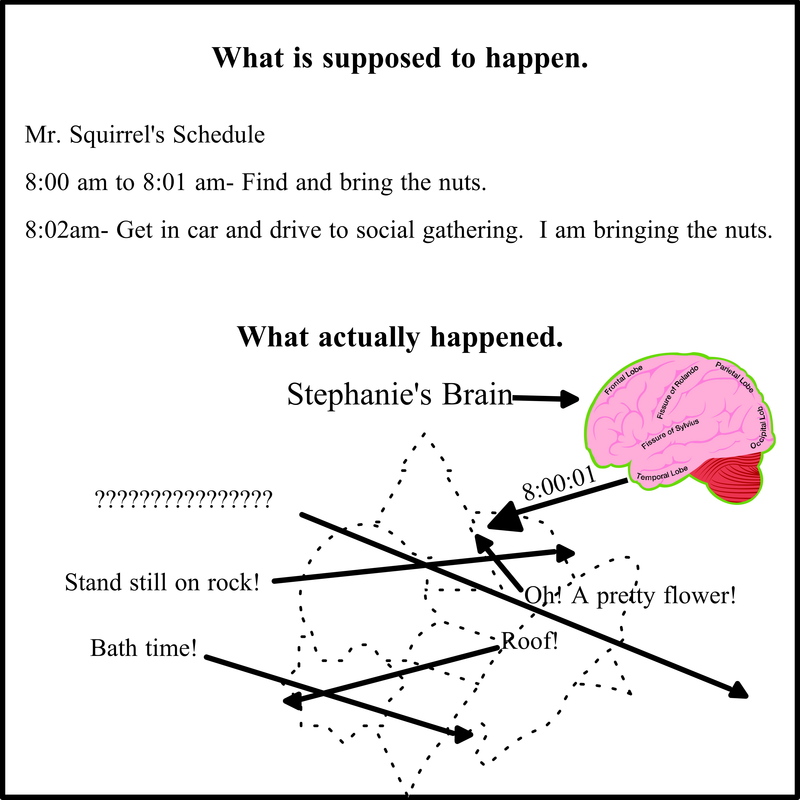 This brain runs on squirrel power, and other tales of ADHD. Aw, darn! I forgot the nuts! Again! Yup. My brain runs on squirrel power. Tiny little rodents are all skittering around in there trying remember to find the nuts. Taking twice as long to write a paper (or a blog for that matter) than anyone else. I put things away in a safe place, and then completely forget where the safe place is. Make lists. Sometimes I make lists of lists. Writing it down gets it out of my head. I watch movies and TV shows on my computer when I’m writing. Documentaries are especially helpful. Instrumental music works for when I’m reading. I put appointments in my iPhone as soon as they are made with at least 2 alerts. I make schedules with cross off lists. I use sticky notes. Lots of sticky notes. I just let myself clean in circles. It works for me. I keep reminding myself that I need to pay attention when it’s crucial to my task. I give myself small “brain breaks” for about 5 minutes every 20 minus. I play a game or look at Facebook, or some other small thing. I do certain things the same exact way every time whether needs it or not, such as locking the car door. The point is, these strategies work for me. They (read: mostly) get the job done. I’m still not perfect at this, but I function fairly well if I stick to my guidelines and boundaries. The point is, if you want to overcome something like ADHD, you got to first admit that there is a problem. You also need to do research to understand the problem’s in and outs. Then you got to find what works for you. There is always a way around, under, through, or over a problem. So tell me, are squirrelly in the brain?